Poor Dr. Frankenstein. Busy on a doomed mission, chasing his rogue monster over frozen seas of ice! It is in this terrible terrain where -- in Mary Shelley's novel "Frankenstein" -- we first encounter the, how to say, mad scientist who created a man out of the body parts of the dead. But this all comes later. First we meet Robert Walton, a young Englishman who, in an effort to give his life purpose, is arranging an expedition to the North Sea. In St. Petersburg, Russia, he starts recruiting a ship's crew, and within months is off. However cheered he may be by the start of his journey, he is lonely and friendless, as he reports to his sister in letters back home. The situation worsens when his ship gets stuck in ice -- being stranded out in the middle of an icy nowhere with only your crew (whom you respect but have little in common with) is maybe not the best situation for making new friends. From his ship, Walton spies a fearsome figure skating across the ice on a sleigh. Later, his ship is happened upon by a weary man who, as it turns out, is chasing the man, or rather the creature, who had sledded by not long before. 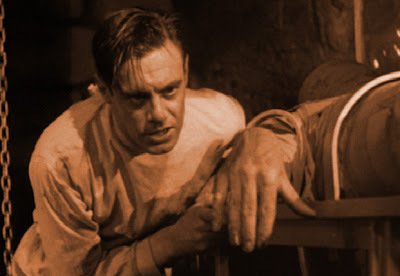 That second man is Dr. Victor Frankenstein, who in time unfolds his dreadful tale to Robert Walton. Walton is delighted to have a friend, and Victor Frankenstein is relieved to have someone to unburden himself to. After all, he's got a thing or two to unload: as we learn over the course of the book, Victor created a man out of corpses, and that creature went on to kill innocents, which compelled Victor to follow him to the ends of the earth to stop him from causing any more destruction. The novel, in this way, is framed by listening -- Robert listens to Victor carefully, and acts as a set of ears for the reader; we listen to this story through him. As Robert bends his ear towards Victor, so are we inclined to bend our ears towards the novel. (In a sense, the reader takes the place of Robert's sister Elizabeth, the silent recipient of his letters. It's yet another layer of listening in the book.) But the fact of the story being told through someone else is more than just a literary device. Robert's open ears give Victor a reason to tell of his awful adventures; any person who was less ready than Robert, or could not hear the tale, or did not want to hear it, or thought ill of Victor for his actions, or disdained him -- such a person could not draw the story out of Victor, or at the very least could not relate it with such sensitivity. But that's not the best part of it. In Robert we have a sorely lonely man stuck in the ice on a make-or-break mission; perhaps he is more likely to listen to whatever reasonably intelligent company comes along! Besides, he gets to hear a fantastic story he can tell at dinner parties the rest of his life ("Didn't I tell you about the time I met the mad scientist?"). But Victor is an attentive listener as well, as Robert reports: "Yet, although unhappy, [Victor] is not so utterly occupied by his own misery but that he interests himself in the projects of others. He has frequently conversed with me on mine, which I have communicated to him without disguise. He entered attentively into all my arguments in favour of my eventual success and into every minute detail of the measures I had taken to secure it." Granted, Robert says that before Victor actually tells his story, so maybe Victor does end up being pretty self-absorbed. But I like to think not: here's a mad scientist whose life's work has gone terribly amuck, and he goes on a wearisome and possibly fruitless quest to destroy the monster he created. And yet, from the very start, he is not so totally self-absorbed as to ignore the concerns of those around him. I'd venture that we all know people who get wrapped up in their own worries; well, they've got nothing on Victor Frankenstein! We should all be so responsive in our interactions.